Look. I mean, I'm loving it. Look. The fact that the president of the United States has the worst taste on the planet has been documented before (his favorite type of steak? Bone dry with ketchup, folks). 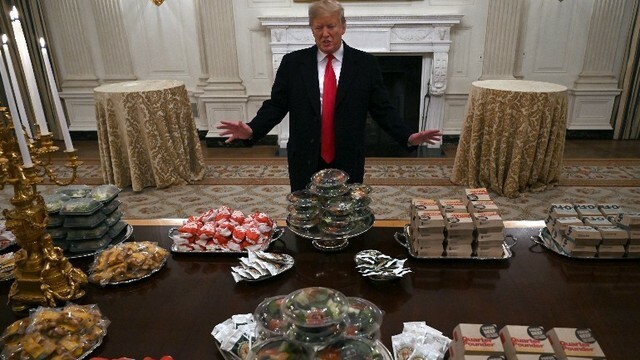 But just in case America needed a strong visual to be reminded the president is a giant fascist man baby, here we have him reenacting what is basically a gag in the Maculay Culkin 90’s Richie Rich movie and showing off a vast spread made up of packaged McDonald’s food. Check out the big freak showing off his damn burgers below. This was the glorious White House spread that President Donald J. Trump offered the Clemson Tigers, the South Carolina winners of the College Football Playoff National Championship: McDonald’s, Wendy’s, Burger King, and pizza. If I was visiting the White House and the president I would expect filet mignon, caviar, not greasy hamburger trash done by candlelit dinner. Whatever. The president was very, very proud that he paid for all of this McDonald’s, which like– I don’t think you should be proud of buying this much cheap food. For all intents and purposes, McDonald’s is the opposite of White House food. You eat McDonald’s because you either don’t care what you eat, or you want to go out to eat and you only have a few bucks. It’s what you unwrap as you tearfully imagine eating fine meals beyond your Earthly knowledge with the president someday. Well, now if you want to eat what the President’s guests eat, just go to McDonald’s with a silver plate and order the Filet-o-Fish with extra tartar sauce or whatever. Hell, the McDonald’s might even let you buy one of the Happy Meal toys if you’re good enough… take THAT Mr. President!!! Seriously, look at the Tweet above. If the president said I was a “big eater”, I guess I would walk into the ocean. But also, if you’re the kind of college student who’s excited about meeting a president who had three kids die in concentration camps under his watch, maybe you deserve McDonald’s burgers. When you see the winning team in 2022 eating fine caviar with President Warren or whatever, just remember folks: you guys got exactly the meal you deserve. ME: uhhh nice banquet, president jughead!! What do you think of this freak’s hamburger spread? Let us know in the comments or on Twitter at @WhatsTrending.